A research initiative founded and directed by UC Riverside’s Karthick Ramakrishnan was awarded the “Beacon of Democracy” from the Washington, D.C.-based organization Asian and Pacific Islander American Vote, or APIAVote. Ramakrishnan, a professor of public policy and political science, established the initiative, AAPI Data, in 2013 with the goal of making demographic data and policy research on Asian Americans and Pacific Islanders, or AAPIs, more accessible to a variety of audiences. AAPI Data is now part of the Center for Social Innovation, which Ramakrishnan founded with significant philanthropic support in 2018. APIAVote presents its Beacon of Democracy award annually to an individual or entity who has demonstrated leadership and served as a source of guidance and inspiration to increasing civic engagement. 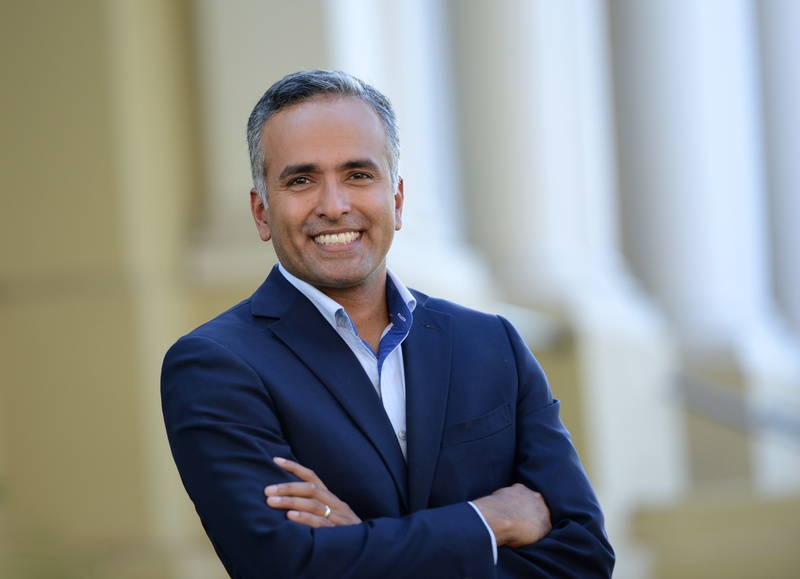 Karthick Ramakrishnan, a professor of public policy and political science, also directs UCR's Center for Social Innovation. APIAVote Executive Director Christine Chen said the organization selected AAPI Data as this year’s recipient of the award in recognition of the initiative’s commitment to shedding light on the Asian American and Pacific Islander community — now the fastest-growing racial group in the U.S. — through ongoing research, surveys, analysis, and media engagement. 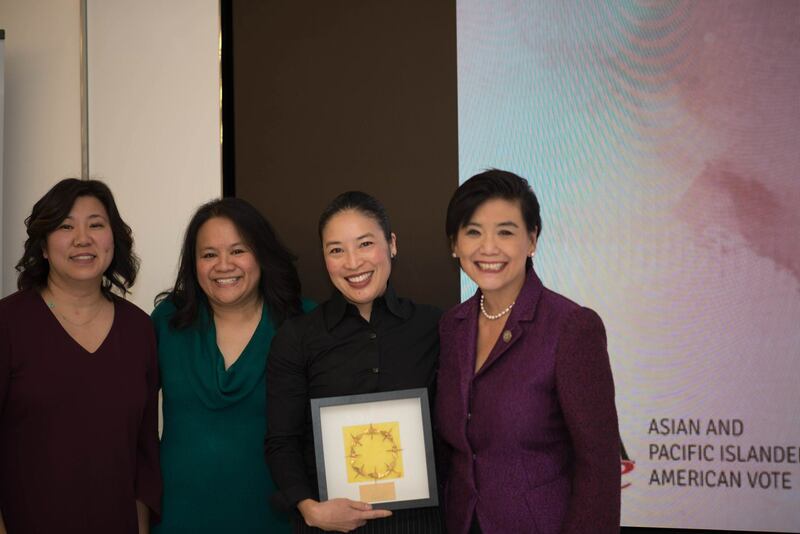 Janelle Wong, one of AAPI Data’s senior researchers and a professor of American studies at the University of Maryland, accepted the honor on behalf of AAPI Data during a reception held in Washington, D.C., on Dec. 11. Also in attendance to co-present the award were U.S. Rep. Judy Chu, a Democrat from Southern California who serves as chair of the Congressional Asian Pacific American Caucus, and U.S. Rep. Grace Meng, a Democrat from New York City. Ramakrishnan noted that in recent years, AAPI Data’s researchers have collaborated with APIAVote to produce state fact sheets that have proven especially useful to elected officials involved in policymaking, like Chu and Meng. The two groups also have partnered on the release of survey reports and infographics geared toward boosting the public’s understanding of the Asian American and Pacific Islander electorate, including the 2018 Asian American Voter Survey commissioned before November’s midterms. The project has benefited from the support of two UCR doctoral researchers in political science, Sono Shah and Sunny (Yiming) Shao, and the partnership of Wong and Jennifer Lee, a professor of sociology at Columbia University. Moving forward, Ramakrishnan said he and his research team hope to build relationships with student affairs organizations across the UCR campus that will allow AAPI Data to begin developing data for other key racial and ethnic groups.